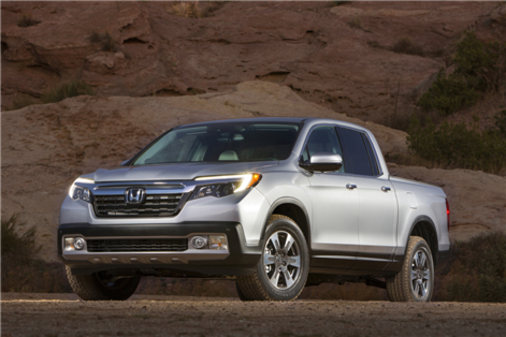 With the 2017 Ridgeline, Honda offers the most practical and versatile midsize pickup truck in its segment to go along with a host of connectivity and safety features. The 2017 Ridgeline indeed offers all the advantages of a pickup while also helping you make the best use of all of its versatility. Features offered in the 2017 Honda Ridgeline include a factory-sprayed box, plenty of hidden storage compartments, a dual-action tailgate for easier loading, a 4’2” wide flatbed between the wheel wells, and eight heavy-duty tie-down cleats to keep whatever is in the box safely in place. Oh, and you get a payload capacity that can reach 713 kg. The 2017 Honda Ridgeline has all the power you could ever need. Equipped with a 3.5-liter i-VTEC V6 direct injection engine, the 2017 Honda Ridgeline features an impressive 280 horsepower cavalry and 262 pounds-feet of torque. The Ridgeline uses a six-speed automatic transmission to handle all that power. 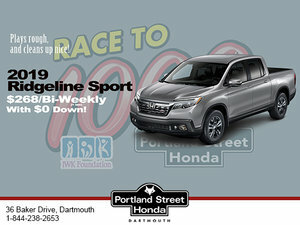 Available starting at $36,790 at Portland Street Honda, the 2017 Ridgeline offers a towing capacity of up to 2,268 kg (5000 pounds). And despite all that, the 2017 Honda Ridgeline has a fuel consumption rating of just 12.8 L/100 km in the city and 9.5 L/ 00 km on the highway. For 2017, the Honda Ridgeline is offered in five distinct versions: LX-HS, Sport, EX-L, Touring and Black Edition. On the road, nothing is more important than your safety and the safety of the people you love. Honda knows this very well. With the 2017 Ridgeline, Honda offers its Honda Sensing driver assistance technology package. Combining safety systems such as front-end collision warning, automatic forward emergency braking, lane departure warning and adaptive cruise control, the 2017 Honda Ridgeline gives a whole new sense to safety out on the road by ensuring that you are not only protected, but by preventing accidents as well. Inside, technology features include a 7-inch touch screen which is is compatible with the Apple CarPlay and Android Auto systems that ensure a perfect connection between your phone and your Ridgeline’s infotainment system. Heated front seats and 18-inch alloy wheels are also part of the standard amenities offered with the 2017 Honda Ridgeline. Other features include a rear center window, a sunroof, a navigation system, dual-zone climate and plenty of other equipment designed to improve comfort. Want to test drive the new Ridgeline? Come and see us today at Portland Street Honda!